Explanation: This beautiful cosmic portrait features NGC 891. The spiral galaxy spans about 100 thousand light-years and is seen almost exactly edge-on from our perspective. 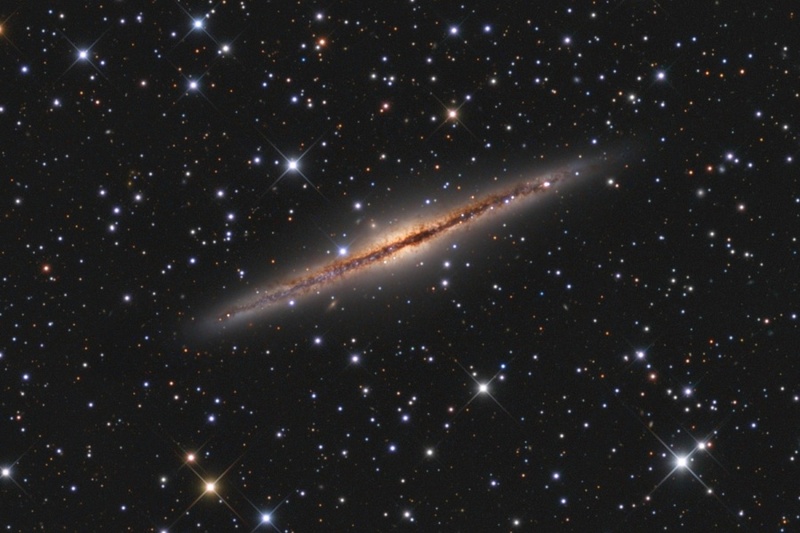 In fact, about 30 million light-years distant in the constellation Andromeda, NGC 891 looks a lot like our Milky Way. At first glance, it has a flat, thin, galactic disk and a central bulge cut along the middle by regions of dark obscuring dust. Also apparent in NGC 891's edge-on presentation are filaments of dust that extend hundreds of light-years above and below the center line. The dust has likely been blown out of the disk by supernova explosions or intense star formation activity. Faint neighboring galaxies can also been seen near this galaxy's disk.